I received this great recipe for a delicious kale salad. I’m excited to try it out! Kale is an excellent nutritious dark, leafy green veg to add to your diet. This food is low in Saturated Fat, and very low in Cholesterol. It is also a good source of Dietary Fiber, Protein, Thiamin, Riboflavin, Folate, Iron, Magnesium and Phosphorus, and a very good source of Vitamin A, Vitamin C, Vitamin K, Vitamin B6, Calcium, Potassium, Copper and Manganese. (Read More here). vegetable and grilled chicken/salmon to make the salad even more delicious! 1) Wash kale, massage and chop. Be careful to rinse the leaves to remove dirt and grit. 2) In a cast iron skillet over medium to high heat, stir sunflower and pumpkin seeds. Remove from heat when they are toasted golden brown. While the skillet is hot, add in a few drops of tamari, which will sear onto the seeds. Remove and let cool. 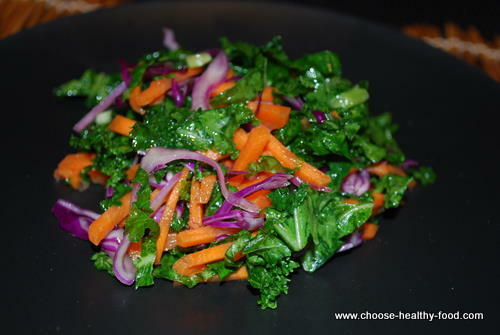 3) In a large bowl combine chopped kale, carrots, cabbage and seeds. Set aside. 4) In a small bowl whisk together oil, Bragg Liquid Aminos, vinegar and oregano and pour over kale mixture. Toss until evenly mixed and chill 2 hours before serving. This salad keeps well refrigerated 2-3 days. Experimenting with greens ALWAYS brings more fun to my meals. Please send me any of your favorite veg or salad recipes to AlisonChen.ND@gmail.com and I will share them with friends.